As anyone who's had a baby can attest to, as they quickly grow so does the pile of outgrown outfits that are barely worn. 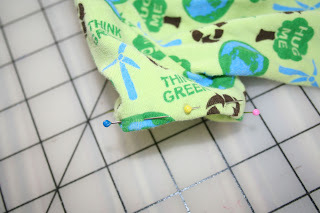 I've seen quite a few clever ways to make clothes last longer (ie adding ruffles to hems for more length or the ubiquitous onesie-into-t-shirt), but some of my favorite items never seem to get a fab "refurb". So here are a few creations I've come up with instead of storing or getting rid of those cute outfits. 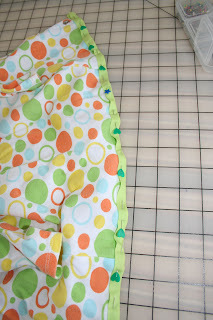 I had 2 newborn size footed sleepers that I had loved, so I cut them just above the area where the crotch & legs meet and sewed on bias tape around the raw edge. Presto, a little snap up jacket with growing room for my chubby 6 month old, 16lb baby. From a tiny newborn sleeper! For the eco-print one, I also cut & hemmed the sleeves so it's ideal for the warm weather heading our way soon. 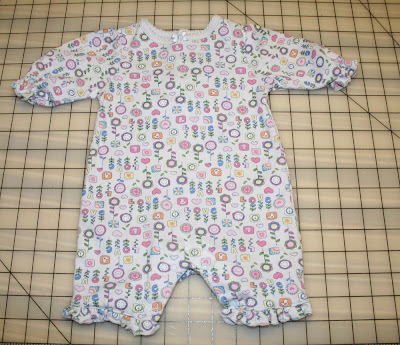 This newborn romper was ankle length when my daughter was a few weeks old, but by cutting it in two, cutting angled short sleeves and adding some folded rib knit to the cut edges, I now have a a flirty little spring two-piece short set that she can wear for at least another few months. I made the waist band a fold over yoga-style so it is can adjust as she grows. And how awesome is it that there's already built in snaps for easy diaper access? 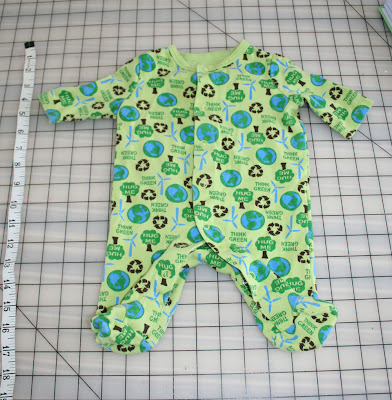 3 tiny baby outfits I loved now have a second life, there's less stuff to squirrel away and it cost $0. Rock on little baby clothes! Great idea for this economy. Thanks. I don't have little ones but I'm going to send my friend your blog. this is a fabulous idea!!! I have 2bags of clothes that I was going to guve away... off to save some for this idea! TFS! Came over from just something I whipped up. 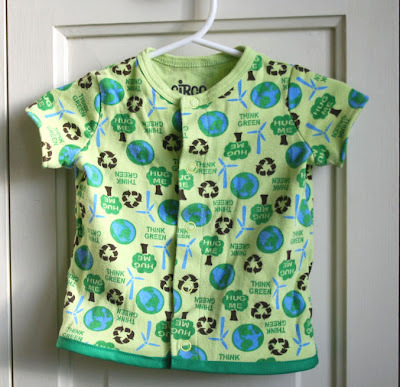 this is a wonderful idea to repurpose baby clothes. What a great idea, and they turned out so cute. That is awesome! I'm so going to have to do that with some of my favorite sleepers and stuff that my daughter has outgrown. I love repurposing clothes! 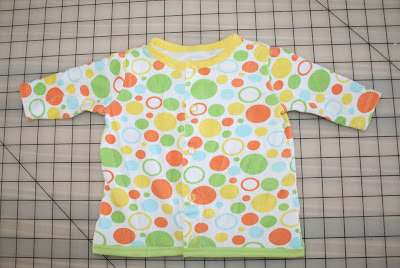 And Baby clothes are too cute! Great job extending thier life! Hey, I hopped over from The Girl Creative's New Friend Friday, and I'm so glad I did! I've seen a lot of your stuff (I think I even commented on your felt house-along week 1 [on which I am woefully behind! ]}, and LOVE it! These are particularly adorable. My little boys growing out of his baby stuff, and this is such a clever idea to alter some to grow with him. Thanks! ADORABLE! I wish I had known about this when my daughter (now 15) was little! Great idea. I planned on running to get some fabric to add to miss G4 dress the other day but haven't gotten there yet-she cut the bottom off her dress. HAVE YOU RE-signed up to follow the new blog. You won't get my updates if you don't? Your old follower status doesn't carry over-blame Google, not me. Thank you so much for posting this and linking to my Penny Pinching Party. This is exactly what I am looking for with my Penny Pinching Party so I will be featuring you tomorrow. Great idea! I need to try this! Link it up to Mad Skills Monday at SuperStinkyBoys! I just found your blog and oh my goodness you are so creative! 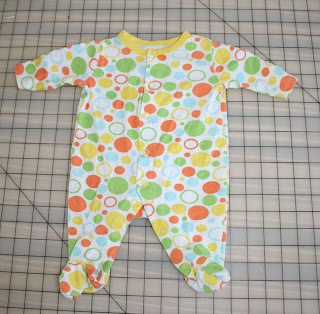 I love how you made newborn clothes into different outfits for an older baby! It's simply amazing and inspiring! Wow, great tips for anyone with little ones. We have that same green jumper in a bigger size. I had to cut out the feet to get some extra use out of it.